Note The following chapter can be sometimes a bit hard to get through. Persist and finish it; deployment is an important part of the website development process. This chapter is placed in the middle of the tutorial so that your mentor can help with the slightly trickier process of getting your website online. This means you can still finish the tutorial on your own if you run out of time. As you learned, a website has to be located on a server. There are a lot of server providers available on the internet, we&apos;re going to use PythonAnywhere. PythonAnywhere is free for small applications that don&apos;t have too many visitors so it&apos;ll definitely be enough for you now. The other external service we&apos;ll be using is GitHub, which is a code hosting service. There are others out there, but almost all programmers have a GitHub account these days, and now so will you! These three places will be important to you. Your local computer will be the place where you do development and testing. When you&apos;re happy with the changes, you will place a copy of your program on GitHub. Your website will be on PythonAnywhere and you will update it by getting a new copy of your code from GitHub. Note If you already did the Installation steps, there&apos;s no need to do this again – you can skip to the next section and start creating your Git repository. Git is a "version control system" used by a lot of programmers. This software can track changes to files over time so that you can recall specific versions later. A bit like the "track changes" feature in word processor programs (e.g., Microsoft Word or LibreOffice Writer), but much more powerful. You can download Git from git-scm.com. You can hit "next" on all steps except for two: in the step where it asks to choose your editor, you should pick Nano, and in the step entitled "Adjusting your PATH environment", choose "Use Git and optional Unix tools from the Windows Command Prompt" (the bottom option). Other than that, the defaults are fine. Checkout Windows-style, commit Unix-style line endings is good. Do not forget to restart the command prompt or powershell after the installation finished successfully. Download Git from git-scm.com and follow the instructions. Note Check your current working directory with a pwd (Mac OS X/Linux) or cd (Windows) command before initializing the repository. You should be in the djangogirls folder. Initializing the git repository is something we need to do only once per project (and you won&apos;t have to re-enter the username and email ever again). 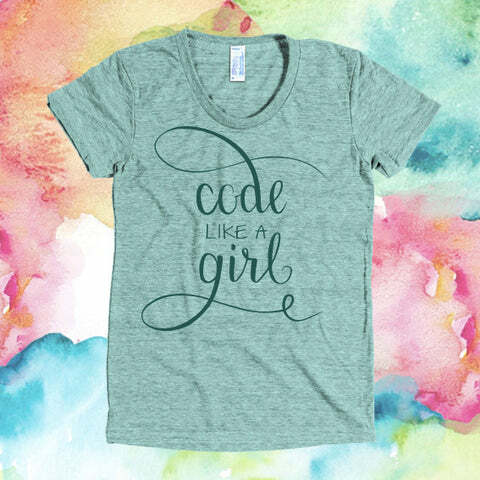 And save it as .gitignore in the "djangogirls" folder. Note The dot at the beginning of the file name is important! If you&apos;re having any difficulty creating it (Macs don&apos;t like you to create files that begin with a dot via the Finder, for example), then use the "Save As" feature in your editor; it&apos;s bulletproof. And be sure not to add .txt, .py, or any other extension to the file name -- it will only be recognized by Git if the name is just .gitignore. Note One of the files you specified in your .gitignore file is db.sqlite3. That file is your local database, where all of your users and posts are stored. We&apos;ll follow standard web programming practice, meaning that we&apos;ll use separate databases for your local testing site and your live website on PythonAnywhere. The PythonAnywhere database could be SQLite, like your development machine, but usually you will use one called MySQL which can deal with a lot more site visitors than SQLite. Either way, by ignoring your SQLite database for the GitHub copy, it means that all of the posts and superuser you created so far are going to only be available locally, and you&apos;ll have to create new ones on production. You should think of your local database as a good playground where you can test different things and not be afraid that you&apos;re going to delete your real posts from your blog. Go to GitHub.com and sign up for a new, free user account. (If you already did that in the workshop prep, that is great!) Be sure to remember your password (add it to your password manager, if you use one). 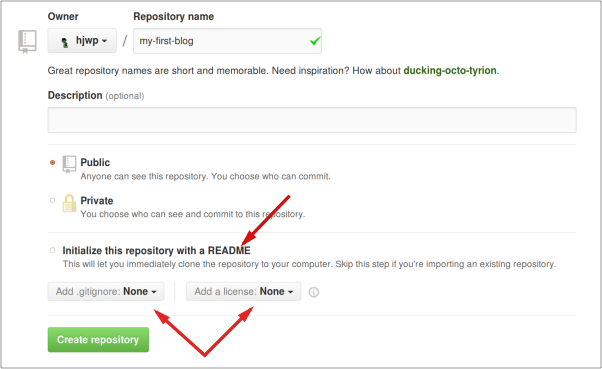 Then, create a new repository, giving it the name "my-first-blog". Leave the "initialize with a README" checkbox unchecked, leave the .gitignore option blank (we&apos;ve done that manually) and leave the License as None. Note The name my-first-blog is important – you could choose something else, but it&apos;s going to occur lots of times in the instructions below, and you&apos;d have to substitute it each time. It&apos;s probably easier to stick with the name my-first-blog. 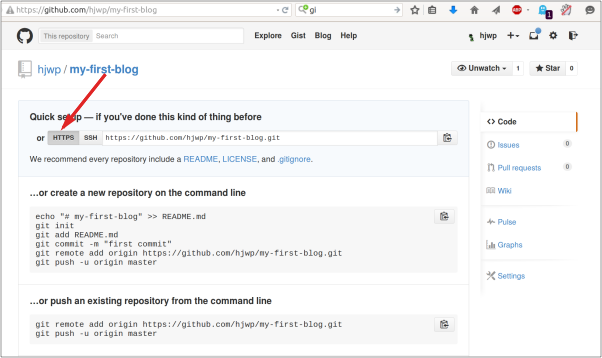 Now we need to hook up the Git repository on your computer to the one up on GitHub. Note You might have already created a PythonAnywhere account earlier during the install steps – if so, no need to do it again. PythonAnywhere is a service for running Python code on servers "in the cloud". We&apos;ll use it for hosting our site, live and on the Internet. We will be hosting the blog we&apos;re building on PythonAnywhere. Sign up for a "Beginner" account on PythonAnywhere (the free tier is fine, you don&apos;t need a credit card). Note When choosing your username here, bear in mind that your blog&apos;s URL will take the form yourusername.pythonanywhere.com, so choose either your own nickname or a name for what your blog is all about. Also, be sure to remember your password (add it to your password manager, if you use one). then select the tab named "API token", and hit the button that says "Create new API token". 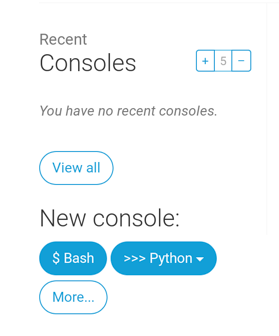 Go back to the main PythonAnywhere Dashboard by clicking on the logo, and choose the option to start a "Bash" console – that&apos;s the PythonAnywhere version of a command line, just like the one on your computer. Note PythonAnywhere is based on Linux, so if you&apos;re on Windows, the console will look a little different from the one on your computer. That should print out some things like Collecting pythonanywhere, and eventually end with a line saying Successfully installed (...) pythonanywhere- (...). On PythonAnywhere all those steps are automated, but they&apos;re the same steps you would have to go through with any other server provider. Type in the details for your admin user. Best to use the same ones as you&apos;re using on your own computer to avoid any confusion, unless you want to make the password on PythonAnywhere more secure. Note This is a beginners&apos; tutorial, and in deploying this site we&apos;ve taken a few shortcuts which aren&apos;t ideal from a security point of view. If and when you decide to build on this project, or start a new project, you should review the Django deployment checklist for some tips on securing your site. Forgetting to create your PythonAnywhere API token. If you see an error when you try to visit your site, the first place to look for some debugging info is in your error log. You&apos;ll find a link to this on the PythonAnywhere "Web" page. See if there are any error messages in there; the most recent ones are at the bottom. There are also some general debugging tips on the PythonAnywhere help site. And remember, your coach is here to help! The default page for your site should say "It worked! ", just like it does on your local computer. Try adding /admin/ to the end of the URL, and you&apos;ll be taken to the admin site. Log in with the username and password, and you&apos;ll see you can add new Posts on the server -- remember, the posts from your local test database were not sent to your live blog. Once you have a few posts created, you can go back to your local setup (not PythonAnywhere). From here you should work on your local setup to make changes. This is a common workflow in web development – make changes locally, push those changes to GitHub, and pull your changes down to your live Web server. This allows you to work and experiment without breaking your live Web site. Pretty cool, huh? Give yourself a HUGE pat on the back! Server deployments are one of the trickiest parts of web development and it often takes people several days before they get them working. But you&apos;ve got your site live, on the real Internet!